Academic writing is noteworthy competence to be accomplished for English as a foreign language (EFL) students to fulfill their academic needs at theuniversity. 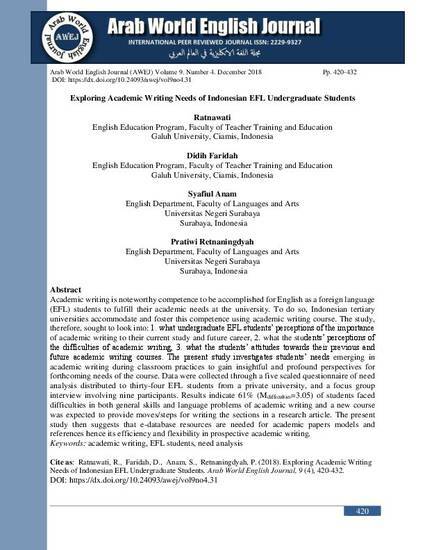 To do so, Indonesian tertiary universities accommodate and foster this competenceusingacademic writing course. The study, therefore, sought to look into: 1. what undergraduate EFL students’ perceptions of the importance of academic writing to their current study and future career, 2. what the students’ perceptions of the difficulties of academic writing, 3. what the students’ attitudes towards their previous and future academic writing courses.  The present study investigates students’ needsemerging in academic writing duringclassroom practicesto gain insightful and profound perspectives for forthcoming needs of the course. Data were collected through a five scaled questionnaire of need analysis distributed to thirty-four EFL students from a private university, and a focus group interview involving nine participants. Results indicate 61% (Mdifficulties=3.05) of students faced difficulties in both general skills and language problems of academic writingand a new course was expected to provide moves/steps for writing the sections in a research article. The present studythen suggests thate-database resources are needed for academic papers models and references hence its efficiency and flexibility in prospective academic writing.